Joseph Luft and Harrington Ingham in 1955 created this ‘Window’ concept to understand how individuals work within teams and to improve productivity, communication and collaborative working. It is frequently used within counselling to explore self awareness. It is a metaphor for displaying ourselves, drawing on ideas of visibility and transparency as well as curtaining off areas to keep them protected from on lookers who may mean harm. I wonder if this tool can also be used to understand the complexity of the patient presenting to their doctor or Health Care Professional (HCP)? The transparent two way picture. This is what the patient is willing and able to show to their doctor. But what is it that the doctor believes they are being shown? And what are they willing to see? The picture is quite a simple discrete one, I believe that too often the view for the doctor and HCP is the illness and treatment for which their patient has been diagnosed. This is not necessarily so for the patient, their presenting picture; what they make visible, may be quite different, not even on the radar of the doctor or HCP. For example they may be showing as an anxious parent unsure of their ability to provide for their children, a highly paid business man who is in denial ‘not very ill at all’. So despite this quadrant being ‘open’, and that our patient willing to disclose some of them self, is the same picture being seen by the doctor? Is the doctor, only looking to see a patient with an illness, not a person? This area is designed to represent what the other person can see but the patient themselves cannot see. I have interpreted this slightly differently to emphasise the knowledge the HCP or doctor has about the patient because of their illness. This area is saturated by the doctor’s knowledge about the patient’s diagnosis, prognosis, and expected complications. So they see, or focus on their own intelligence and ‘dump’ it on the patient. Whether they are able to tune into other aspects of the patient ( not their illness) such as their bravado, courage, or fear, would provide potential for an improved empathic relationship. 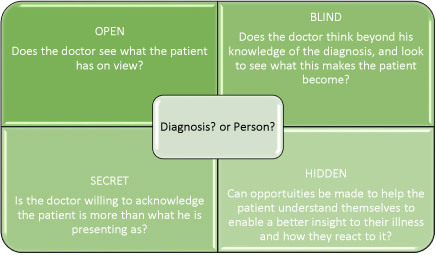 Do the blind and open quadrants merge, the patient becoming the illness, detached from the person? Perhaps the doctor too is being blind? This is describing the things the patient is keeping well guarded and hidden from the HCP or doctor who will be completely unaware of them. An acknowledgement by HCP’s that they in fact are not being presented with the whole of their patient and the patient is concealing aspects of themselves may be useful. It may be relevant to reflect: what is my patient hiding from me?Is this related to their illness? The situation, environment? Am I being presented with the whole person? How can I facilitate openness? What impact will this have on concordance? Self management? 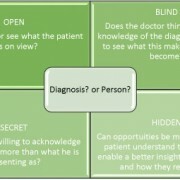 Neither the HCP nor the patient knows what is hidden. But by providing space to explore the potential for understanding how the patient’s illness is impacting on relationships, behaviours and emotions will only serve to increase the potential for our patient to modify their behaviour to help them reach the potential they hope for themselves. So facilitating the exploration of anxiety, poor sleep patterns, bad dreams and other negative characteristics may prove beneficial for physical health and the relationship between patient and HCP/ doctor, and patient and their illness. I would just like to conclude that there are missed opportunities within the NHS care settings that deny the patient the opportunity to be truly known by health care professionals such as doctors, who claim to wish to do patients no harm and yet understand very little about the patient they wish to avoid harming.